Applications are available October 1 on the Law School web site. Application review begins in November. Application deadline is April 15. No. 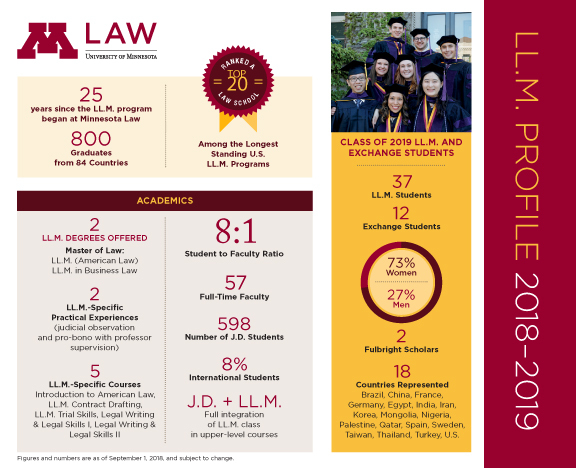 Participants in the University of Minnesota Law School’s LL.M. Program are expected to complete the full academic year (a minimum of 24 credits), here. The class of 2019 program begins on August 9, 2018, with the mandatory “Introduction to American Law” course, and continues through graduation on May 11, 2019. Yes. You must have completed a law degree at an institution outside the U.S. The purpose of the LL.M. program is to provide international lawyers with exposure to the American legal system. International lawyers gain insight into the common law system and case analysis, while familiarizing themselves with American culture through interaction with J.D. students and other professional and social events. If offered admission to the program, you must provide evidence of financial support for tuition, fees, insurance, and book expenses (estimated at $57,800 for 2018-19), and living costs for one year (estimated at an additional $15,500 for one person in modest student accommodations) for a total of $73,300. Completion of the LL.M. degree does not qualify students to take the bar exam in the State of Minnesota. The LL.M. degree may enable students to sit for the bar in jurisdictions that allow LL.M. graduates to take the bar. Each state has its own regulations regarding qualification for a state bar exam and students should do their own research regarding these regulations. The National Conference of Bar Examiners annual guide includes bar information for all individual states.